A whirlwind tour of India, crisscrossing may urban and rural landscape of the country in pursuit of getting reactions from the cross section of the countrymen regarding the demonetisation policy of the government has thrown up some interesting observations. Broadly, there are two prevalent views, one with the swansong ‘no pain no gain’, other hating from the bottom of the heart this senseless policy of the government that made them suffer unnecessarily. With due sympathies to those who have to undergo real pain and agony from this policy constipation of the current regime, those having sweet words for the current dispensation have some interesting observations to make. Those who are blatant supporter of the current regime have their own wisdom to sell as to how the country will benefit from this monetary reform. Invariably, all are unanimous that this policy is a masterstroke and it will flush out the black money from the system. Such people are hopeful that this will happen at the official deadline that is December 30, 2016. 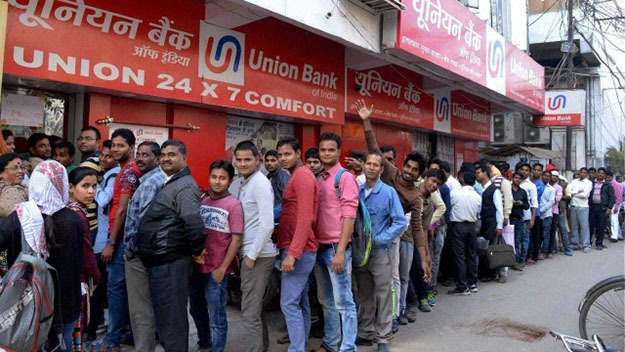 The excitement is building up those people having black money will throw them on the road and the common man will make a bonfire of it, this on the new-year eve. The other perception, the demonetization will control the skyrocketing prices that are currently ruling the roost due to access money. The excitation is after demonetization people will have less money, in such scenario the prices may plum down and will not shoot up. The other perception is, demonetization will bottle up the terror factory, and this policy will control the menace of terrorism in the country. The thinking is, it’s with 500 & 1000 notes that terror machines are procured and when that’s gone, it will be curtains on the terror shops. In this cacophony different voices regarding the demonetization policy, there is another defiant voice that sounds resolute. This voice is from those who actually have some ill-gotten currency and want to take up the challenge by the scruff. They are leaving no stone unturned to adjust their ill-gotten and their anthem is ‘just beat it’! Their point of view is, even though they may be black money, they have toiled hard to pileup and they give it up for a dumb policy. They say it requires extraordinary wisdom guts and brains and calculated risks to hoard such money, how can this be put on the road for making bonfire this winter? They are scheming hard to adjust their ill-gotten money before the deadline of December 30, 2016. Will they succeed in their nefarious design remains to be seen but the common thinking is, those who have the black money may somehow or other getaway with it. There little doubt that the, government will issue huge statistical figure to justify its grandiose policy and there will be a blitzkrieg of propaganda this surgical strike to flush out black money was a huge success. Will opposition accept such true lies remains to be seen? Equally the theory that the demonstration will control the price rise and shut the terror shops will be gulped by the opposition or it may come a cropper. Notwithstanding the facts, the demonetization policy is throwing some imponderables that are beyond comprehension. One, how many people are having black money in our country? Maybe 5 percent or near about and in order to catch them why the government of the day has made 95 per cent people to suffer. Can’t this ruling dissension devise any other innovative policy to meet its stated objectives to flush out the black money from the system? The second imponderable is, if democracy is for the people and by the people, then why the same people are made to suffer by any such ill-conceived policy on which power is entrusted to make their life less miserable. Why the entire population has been made beggars by the current ruling regime. Why they are subjected to such misery and hardship? The decision that has been taken under the cloak of nationalism smacks of autocratic rule and dictatorship. Is this not is an assault on the democratic structure of the country. Definitely those riding on the high horse of power have battered and bruised the edifice of democratic structure of the country. Finally, this kind of monetary reform will have political fall out. The ensuing election in few states that is due in some time will be a referendum on this policy. There exits a perception in the country that those who backed the current regime in 2014 with all their ill-gotten wealth in that electoral fray have a reverse role to play in the forthcoming state elections. They will not rest in peace, till their scripted plot is well executed. There are some resemblance with the national emergency of 1975 and the demonetization policy of 2016. The objectives of the national emergency was to overall reform India and accelerate the growth of the country, but they way it was planned and executed by then government boomeranged on its face and people tooth and nail rejected such surgical restructuring of the country. In the same vein, the demonetization policy is being rejected by the countrymen who are subjected to reel under unnecessary agony and hardship. It’s hard time for the government to sell the idea of no pain no gain. The demonetization policy has come a cropper. ​Will new notes which replace demonetised currency find itself in circulation soon?